Express your feelings of love and joy to your daughter for beginning a beautiful family with our Personalized To My Daughter Picture Frame. An attractive keepsake which look wonderful in her home. Your To My Daughter... Natural Wood Bi-Fold Personalized Picture Frame measures 11 3/4"x 7 3/4" and holds two 4"x6" photos. Includes FREE Personalization! Choose from our poem ... Daughter of My Heart and personalize with any opening sentiment and any two line message after the poem or Create Your own Poem, up to 20 lines. My Girl, look at me and ask where hope lies. And makes the stars sparkle in the skies. Do you not know the wonder that you bring? It makes flowers bloom and birds sing. With warmth and caring like a hot spring. It's fireworks and big parades. Through all eternity it cascades. Forever I'll be there for you. So long as grass is green and sky blue. Just one of our beautiful gifts for mom! 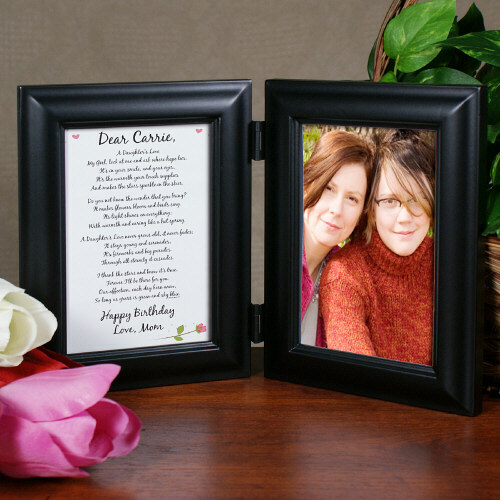 Picture Frame measures 11 3/4" x 7 3/4"
Additional Details GiftsForYouNow offers a wide selection of Personalized Mother's Day Gifts suitable for Mom, Grandma and a Mom-to-be. We offer lovely Mother's Day Keepsakes and thoughtful Mother's Day Apparel perfect for celebrating this day for Mom. Shop GiftsForYouNow.com today for all your Personalized Mother's Day Gifts today.